The Saga of Tom Horn: Is the Hanged Man’s Ghost Still at Large? 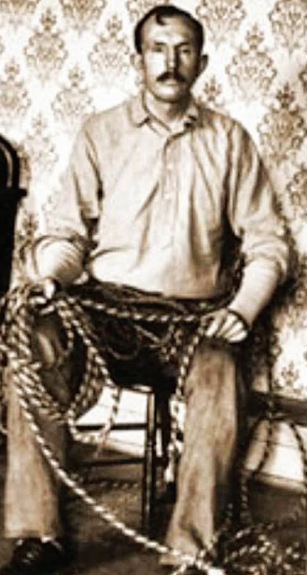 At the turn of the twentieth century in Wyoming, the “range wars” claimed many victims, among them fourteen-year-old Willie Nickell (yes, one of my distant cousins).1 This is the story of his murder and the hanging of his killer—a legendary lawman and now “ghost.” It begins over a quarter of a century earlier in my home county of Morgan in eastern Kentucky. In 1875, Willie’s father Kelsey P. “Kels” (or “Kelse”) Nickell went west from his Kentucky home to join the U.S. Cavalry, spending much of his time there as an Indian fighter. In fact, his company was encamped just fifty miles south of the Little Big Horn River on June 26, 1876, when General George Armstrong Custer and his men were massacred. Kels Nickell was one of two troopers dispatched to reconnoiter the site, and he reported the overwhelming stench of dead men and horses. Following his discharge in 1880, he opened a blacksmith shop at Camp Carlin, Wyoming, and the next year married a young woman named Mary Mahoney, who, like her husband, was of Irish descent. They homesteaded a ranch at Iron Mountain where they eventually raised eight children (Nickell 1998).